Enjoy a Christian community with up to 40 student residents at K-State Wesley! Pick your roommate(s), worship where you live, and enjoy Christ-centered friendships that will last a lifetime! We have renovated an old fraternity dormitory into our Wesley residential community. We have one floor for women, one floor for men, and one floor for common areas- 13,000 square feet in all. Basic utilities include water, electric/gas, internet access, trash/recycling, on-site laundry, and basic cable on televisions in common areas. Our student center also features a newly renovated community kitchen on the main level of our building and a small kitchenette on the first floor of the residence hall. We also have off street parking for thirty-nine (39) vehicles. Our residential rooms include single and/or double rooms, triple, and quadruple dorm-style rooms. Each room has an extra long twin bed, dresser, desk, and wardrobe for each resident. Residential rooms are available on the second and third floor. There is a common restroom on each floor. Our second and third floors are not currently handicap accessible. However, there is one handicap accessible resident room and restroom on the first floor. By living at Wesley, you will save money and you will be supporting our campus ministry at the same time! Wesley does not offer a meal service plan; however, we do have a community kitchen which students are able to use to prepare meals in groups and individually. This kitchen contains a variety of different appliances that the residents may use at any time. We also have a kitchenette downstairs with a microwave, ice machine, and coffeemaker that residents are welcome to use. 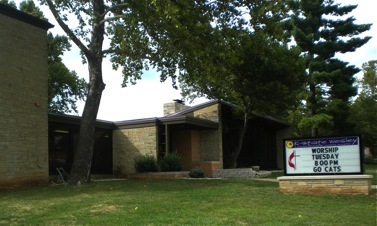 Kansas State University does offer off-campus meal plans, and the Kramer Dining Center is only two blocks from Wesley.